2018 SCTA FALL DOUBLES LEAGUE For players 18yrs+. Format: 3 doubles matches. This league plays October-mid December. 10-12 players per team are suggested. 3.0/4.0 plays on Saturday. 3.5/4.5 plays on Sunday. Playoffs are scheduled for January 5-6, 2019 at the Barnes Tennis Center in San Diego. Sectionals are scheduled for January 26-27, 2019 in the Coachella Valley. USTA ADULT 18 & Over Format: 3.0, 3.5, 4.0, 4.5 play 2 singles + 3 doubles matches (or 1 singles + 2 doubles depending on Local League captains’ choice made at Captains’ Meeting). NOTE: all 3.0, 3.5, 4.0, 4.5 leagues will play 5 lines in post season play. 2.5, 5.0 and Open flights play 1 singles & 2 doubles matches. This is a weekend league starting in January. Date for Playoffs is July 28-29. Sectionals will be played August 11-12 at Costa Mesa TC and Los Caballeros (Orange County). Nationals are played in Oct/Nov. Currently there are no 18 & Over USTA Leagues playing in the Coachella Valley. 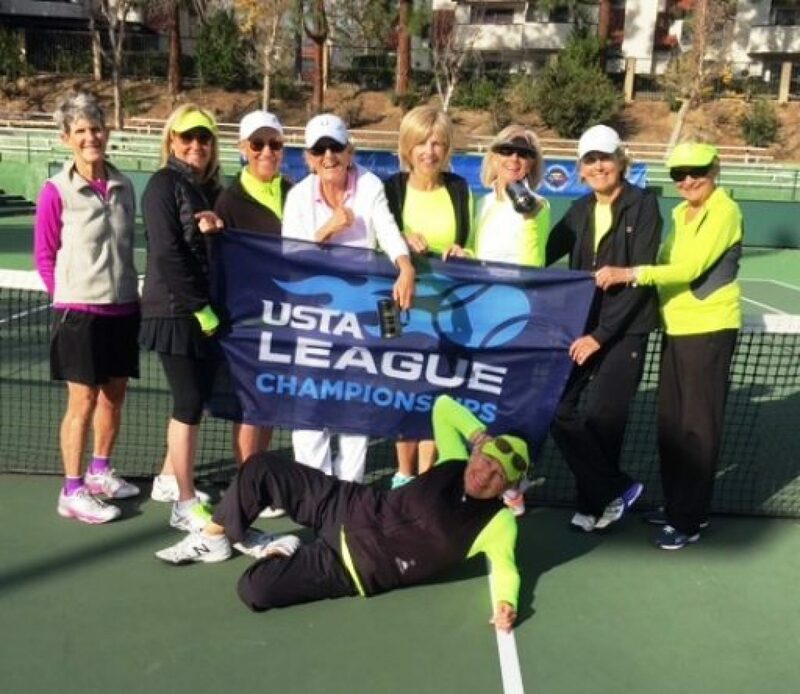 USTA ADULT 40 & Over Format: 3.0, 3.5, 4.0, 4.5+ play 2 singles + 3 doubles matches (or 1 singles + 2 doubles depending on Local League captains’ choice made at Captains’ Meeting). (4.5+ allows 1 to 3 players w/5.0 rating on roster depending on a 3 line or a 5 line local league.) NOTE: all 3.0, 3.5, 4.0, 4.5+ leagues will play 5 lines in post season play. 2.5, 5.0 and Open flights play 1 singles & 2 doubles matches. This is a weekend league starting in January, Playoffs are scheduled for April 28-29 at the El Dorado and Lakewood Tennis Centers in Orange County. Sectionals are scheduled for June 9-10 at Los Caballeros and Costa Mesa Tennis Centers in Orange County. Nationals are played in Oct/Nov. USTA ADULT 55 & Over DOUBLES Format: 3 COMBO (combined rating) doubles matches (6.0, 7.0, 8.0, 9.0). This is a weekday league played January-March. Sectionals are scheduled for September 22-23 at Westlake Athletic Club/Sunset Hills CC (Ventura). Nationals are played in Oct/Nov. 10-12 players are suggested. 7.0 and 9.0 combo plays on Monday. 6.0 and 8.0 combo plays on Wednesday. USTA MIXED DOUBLES 18 & Over/40 & Over Format: 3 COMBO (combined rating) doubles matches (6.0, 7.0, 8.0, 9.0). These leagues play January-March. Date for 40 & Over Sectionals is October 13-14 at Municipal TC/Pershing Park (Santa Barbara). Nationals are played in Nov. 12 players per team are suggested. Day of play is determined at the Captains’ Meeting. Day of play for 2018 is Saturday. CV MIXED DOUBLES 55 & Over Format: 3 COMBO (combined rating) doubles matches (6.0, 7.0, 8.0, 9.0). These leagues are played January-April. 12 players per team are suggested. Day of play TBD @ Capt Mtg. For 2018 the day of play is Saturday. At this point there is NO POST SEASON PLAY. CV TRI-LEVEL MIXED DOUBLES PILOT PROGRAM: there are two flights. 4.5/4.0/3.5 and 4.0/3.5/3.0. This is not a combo league so players must play their rating. There is postseason play as several areas in Southern California already have this league in place. SCTA TRI-LEVEL DIVISION is for players 18yrs+. Format: 3.5/4.0/4.5 flight plays 3 doubles matches. 3.0/3.5/4.0 flight plays 3 doubles matches. One match is played at the 4.5 (4.0) level, one match played at 4.0 (3.5) level, one match played at 3.5 (3.0) level. Plays April-June. Date for Sectionals November 3-4 at Newport Beach Tennis Club (Orange County). A 4.5/4.0/3.5 Tri-Level Invitational is played during BNP Paribas Open in March of the following year. 12 players (4 from each level) are suggested. Tri-Level plays on the weekend. SCTA ADULT 65 & OVER DOUBLES Format: 3 COMBO (combined rating) doubles matches (6.0, 7.0, 8.0, 9.0). 10-12 players are suggested per team. Plays weekdays Jan-Mar. 7.0/9.0 plays on Wednesday. 6.0/8.0 plays on Monday. 7.0 men play on Thursday. Sectionals will held November 17-18 at the Claremont Club. The 6.0 & 8.0 Invitational will be held in Surprise, AZ on January 25-27, 2019 and the 7.0 & 9.0 flights will play on February 1-3, 2019. CV Adult 70 & OVER Women’s DOUBLES plays on Thursday at Shadow Mountain Resort at 1 pm. This is a 4 line league meaning that lines 1 & 2 are made up of 4.0 players and lines 3 & 4 are made up of 3.5 players. There is no post season play but there is a social hour after play at Shadow Mountain’s Top of Court Cafe. In 2019 we are offering this 70s league to men and play will be on Tuesday at Shadow Mountain. More information to follow. Please contact Donna Ringer at donna.ringer@gmail.com for more information on the 70s League and to sign up.